I think dry fried beef chow fun is one of those Chinese restaurant dishes that you either try and love or you get unlucky with a badly done dish and hate it. 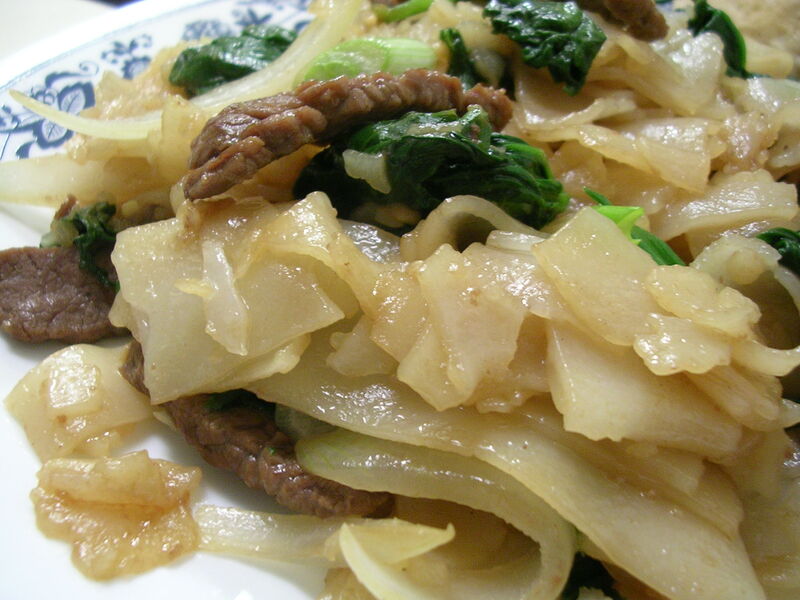 For the most part, I think it’s hard to mess up – the usual culprit in a bad beef chow fun dish would be hard noodles. Normally, there are soft sheets of noodles that have soaked up the flavors from the oyster-based sauce, slippery with the vegetable oil that helps prevent the noodles from sticking and intermingled with flavorful pieces of beef and onions… it’s always so satisfying, even though you know it’s pretty greasy. After seeing my mom buy the premade steamed rice noodle sheets from the Asian market recently, I discovered that you could also use the same noodles to make dry fried beef chow fun! (Just get the plain noodles without dried shrimp and scallions). So when I got back to school, I bought a bag of refrigerated freshly made rice noodle sheets from Super88 in Boston – they come in bags of 1-2 lbs of noodles, all folded into neat squares or rectangles and bagged in clear plastic baggies with vegetable oil to prevent sticking (cost me about $2.75 or so for a 2 lb. bag). I found an easy recipe from About.com, and with a few improvised ingredients, everything came together pretty easily. Dry frying is really just a term for stir frying something without the use of a liquid sauce or oil to fry in. You use dry frying to get things cooked without making it soggy and saucy, or crunchy, and with a hot enough wok, you can make your foods with a nice and smoky flavor this way too. And since I was cooking the chow fun myself, I could add veggies and use a lot less oil to get a healthier version of the same dish, double yum! 1. Cut flank steak into thin strips about 1/4 inch in thickness. Marinate with soy sauce, rice wine, sugar, sesame oil, and cornstarch for 15 minutes at room temperature. 2. 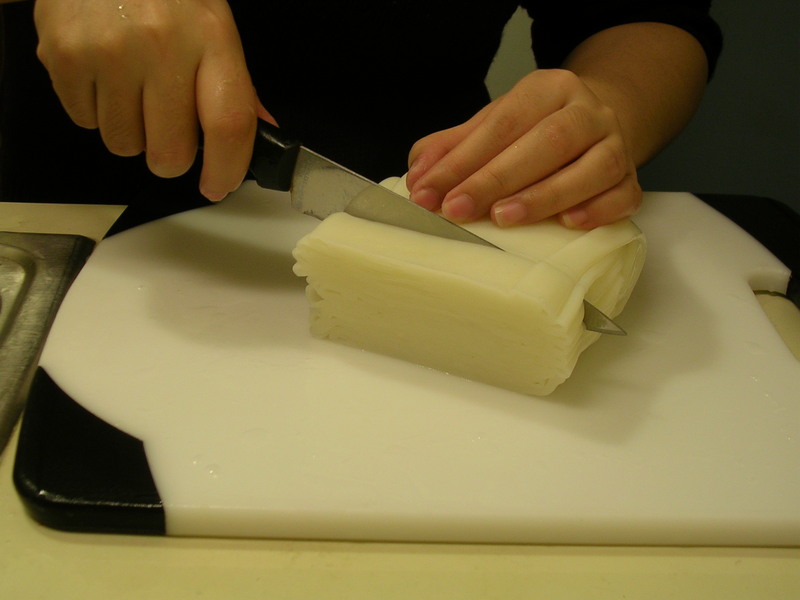 Rinse refrigerated rice noodles under warm water to loosen sheets, applying mild pressure to loosen the folds. Cut noodle blocks into 1 inch strips and peel apart the sheets. Set aside. 3. Heat a skillet with vegetable oil on medium high. Sear beef by laying each piece flat against the skillet, and flipping after a minute. Cook another minute on other side. Remove from pan and clean the pan. 4. Cook the onions until they are starting to turn translucent. In another pan, heat some vegetable oil and gently cook the spinach just until wilted. Drain and set aside. 5. Add some vegetable oil to the onion pan, and add in the rice noodles, stirring vigorously to prevent burning and sticking. Try to coat all the noodles with oil to prevent them from sticking (some will probably occur, that’s okay). Mix in minced garlic, cooked spinach, and cooked beef. 6. Add oyster sauce to the noodles, and mix to allow the noodles to soak up the sauce (they will turn a light brown color). The noodles should soften as they are warmed up. When they are soft and they taste flavorful enough (add more oyster sauce if needed), stir in scallions briefly, then remove from heat and serve. 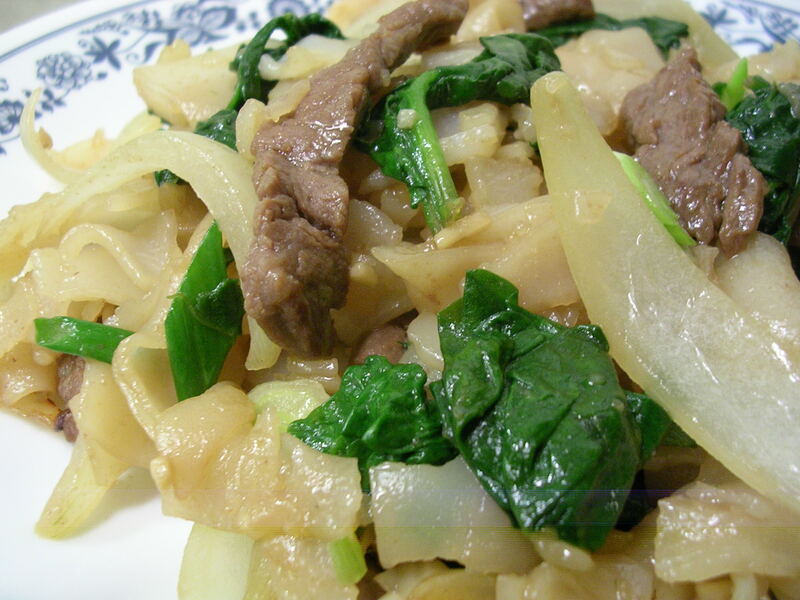 Beef chow fun is best eaten fresh – if you have leftovers, sprinkle some water on top before microwaving. Rice noodles are hardened when they are cold, so make sure you microwave long enough to get them nice and hot. I really enjoyed this dish, even though I had some difficultly stirring the noodles around in the pan without too many casualties flinging outside the skillet (a big wok would have solved my problems). My boyfriend liked eating it with a bit of Sriracha sauce squirted on top, but I thought the flavor was great just the way it was. Best of all, it didn’t taste or feel greasy, and the noodles didn’t stick, so it was really nice. I would add some bean sprouts next time too, but the onions and scallions gave a nice crunch to contrast the soft chewy noodles also. Hah, not so tough after all! This entry was posted on Sunday, April 6th, 2008 at 1:33 am	and posted in Chinese, cooking, recipes, Uncategorized. You can follow any responses to this entry through the RSS 2.0 feed. Swear to God if I get rich, I'm hiring you as my private chef. Name your price! This is my hands down favorite dish! Looks so yummy!